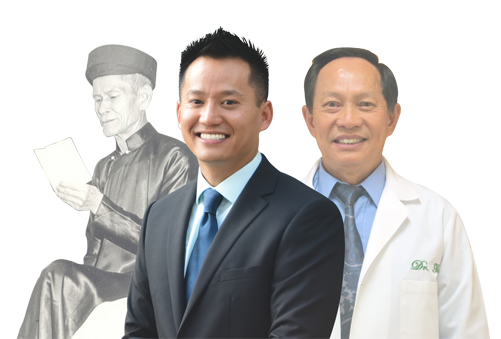 Chinese Traditional Medicine and Vietnamese Traditional Medicine have been practiced in my family for over 100 years through three generations. My grandfather began with herbal medicine as a primary source of treatment in the early 1900's when no other medical treatment methods were available in his village. His medicine and natural treatment methods provided many positive effects for the entire village and the surrounding areas, he then became a healer in the province of Kontum, Vietnam. His documented formulas show that although animal and mineral materials were used, the primary source of remedies were still botanical and the use of cupping on acupressure points. My father Mr. Huynh Trong Tam and his siblings grew up watching their father practiced Traditional Vietnamese Medicine with a deep appreciation for Mother Nature. At an early age, he had an opportunity to observe and learn how his father brought a dying person back to life. In that moment, he knew he wanted to be a healer, he also knew there was a lot more to learn outside of his community. Through his passion for martial art, Huynh Trong Tam acquired a great understanding for the human anatomy and acupressure points. He became a disciple of Vovinam Martial Art (Vietnamese Martial Art) in 1961 and earned the title "Master of Vovinam" in 1984. However, learning the modern medical science was always a desire in my father. This desire has led him to Pharmacology school in Saigon at the age of 20. In 1969 he transferred to Army Medical School; and like many other young Vietnamese men, Master Huynh answered his country's call to serve in the Vietnam War as a military hospital's general manager. After serving in the military and spent years in reeducation camp, my father came back to Kontum to open his practice and raised his family. He was widely known as the "medicine man". In the late 1970s and early 1980s, due to different political views, thousands of immigrants set sail for other countries with the hope for freedom and a better life. Among these people, my family left our home and headed for America. They landed in Bidong Island's Refugee Camps and was later sponsored by a kind American family. During their stay in Bidong Island in 1981, my father served as Chief of Pharmacist at Sick Bay Pulau Bidong Hospital. With similar responsibilities, he also served at World Relief Clinic in the Philippines. In America, my father started his career at York Hospital in Pennsylvania and also practiced for years at Palms Pasadena Hospital, Humana Hospital and Medisave Pharmacy (FL). "Conventional medicine is great for treating symptoms and addressing traumas or diseases utilizing drugs or surgery. It is crucial in most emergency situations because it has all the advances of a valuable system. However, more often than not, I’ve seen this lead to long-term management with an improvement in symptoms at the cost of side effects, which often require more drugs. In countless number of situations where I've seen how a patient would benefit greatly if he uses natural treatment alongside the conventional treatment. The conventional drugs will mask the symptoms and help the patient feel better quickly while the natural treatment will treat the root cause of the health issue so that the body can ultimately heal itself. The results can be measured as a reduction or elimination of drugs, improved vitality and often time, a complete reversal of disease", my father stated. As a Doctor of acupuncture, my father has touched the lives of many people in his community and also around the world through his "Hands of Steel and Heart of Gold" program in Charlotte, NC. His work was later recognized and awarded by mayor Patrick Lloyd "Pat" McCrory, MAJ. GEN. Gerald A. “Rudy” Rudisill, Jr., and the governor of North Carolina, James B. Hunt, Jr in 1998. At Anna Health clinic, we offer innovative, safe and effective acupuncture treatments and alternative medicine services accessible for everyone. By using a comprehensive traditional medicine system that has more than 5,000 years of history and combining it with modern science technology, our experienced and compassionate acupuncture physicians and their staff confidently provide individualized patient-centered care to help you achieve a lifetime of optimal wellness. We can help you manage many chronic illnesses, hard-to-treat disorders, and health concerns that have no clear definition or causes. In addition, Anna Health also maintains a comprehensive on-site natural medicine pharmacy with a wide range of herbal products and raw ingredients that can be tailored to a more complex and individualized formula. Herbal liquid pediatric formulas are also available for children as needed. Because our products are created using only selective premium quality medicinal herbs available around the world by three generations of doctors and pharmacists with over 100 years of accumulated knowledge and expertise, we truly believe that we have the most reliable herbal products on the market today to effectively and safely strengthen both your body and mind. "Helping others is a privilege and an honor.” At Anna Health, you can expect compassionate and personal service every time. If you have questions, you get answers. If you have a problem with your treatment, you get the personal attention you need to solve it promptly. Research shows that human connection has the power to decrease pain, lessen anxiety, lower blood pressure, and increase the capacity of our immune system to fight disease. Kindness in health care has the power to help patients heal faster. It's hard to put a dollar value on service like that, but we believe it does make a big difference. We are here with you on your journey to a healthier and happier life. We look forward to welcoming you to Anna Health Acupuncture and Herbal Medicine!